TEHRAN, Iran — Iran’s supreme leader has restricted the range of ballistic missiles manufactured in the country to 2,000 kilometers (1,240 miles), the head of the paramilitary Revolutionary Guard said on Tuesday. This limits their reach to only regional Middle Eastern targets. The comments by Gen. Mohammad Ali Jafari to reporters mark the first acknowledgement that Ayatollah Ali Khamenei has imposed limits on the country’s ballistic missile program. It also appears to be an effort by Iranian authorities to contrast its program — which they often describe as for defensive purposes — against those of countries like North Korea, which now uses its arsenal to threaten the United States. The range of 2,000 kilometers encompasses much of the Middle East, including Israel and American military bases in the region. That’s caused concern for the U.S. and its allies, even as Iran’s ballistic missile program was not included as part of the 2015 nuclear deal that Tehran struck with world powers. This is the first time Iran's S-300 air defense system has been displayed in public. Speaking on the sidelines of a conference in Tehran, Jafari told journalists that the capability of Iran’s ballistic missiles is “enough for now.” The Guard runs Iran’s missile program, answering only to Khamenei. However, Jafari said he didn’t believe there would be any war between Iran and the U.S. While keeping with the anti-American tone common in his speeches, Jafari’s comments seemed to be timed to calm tension over Iran’s missile program. By limiting their range, Iran can contrast itself against threatening countries like North Korea, as Pyongyang has tested developmental intercontinental ballistic missiles that could potentially reach the U.S. mainland and conducted its most powerful nuclear test to date. Pyongyang also flew two powerful new midrange missiles over Japan, between threats to fire the same weapons toward Guam, which is a U.S. Pacific territory and military hub. The Trump administration already sanctioned Iran for test-firing a ballistic missile in February, with then-national security adviser Michael Flynn warning Iran it was “on notice.” President Donald Trump’s recent refusal to recertify the nuclear accord has sent the matter to the U.S. Congress. On Thursday, the U.S. House of Representatives voted to put new sanctions on Iran for its pursuit of long-range ballistic missiles, without derailing the deal. Israel's defense minister warns that Iran aspires to deploy “tens of thousands of Shiite militia fighters” at air and naval bases in Syria once the U.S.-led coalition concludes its mission against ISIS. Iran long has insisted its ballistic missiles are for defensive purposes. It suffered a barrage of Scud missiles fired by Iraq after dictator Saddam Hussein launched an eight-year war with his neighbor in the 1980s that killed 1 million people. To build its own program, Tehran purchased North Korean missiles and technology, providing much-needed cash to heavily sanctioned Pyongyang. 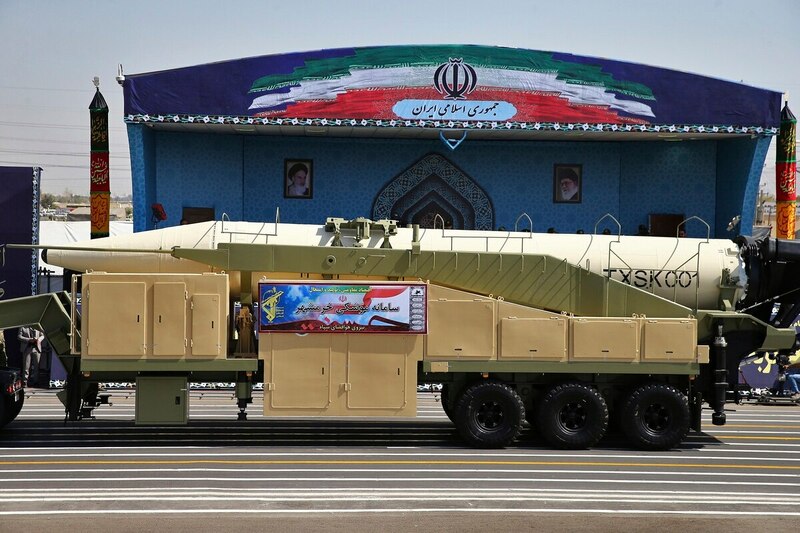 Iran today likely has the capability to go beyond 2,000 kilometers with its Khorramshahr ballistic missile, though it chose to limit its range by putting a heavier warhead on it in testing, Elleman said. The Gulf Arab nations surrounding Iran, while hosting American military bases, also fly sophisticated U.S. fighter jets that Iranian forces can’t match. The ballistic missiles provide leverage against them, as well as the U.S.-made anti-missile batteries their neighbors have bought, according to Tytti Erasto, a researcher at the Stockholm International Peace Research Institute. Still, Iran could use the missiles as “a tool of coercion and intimidation,” said Behnam Ben Taleblu, the senior Iran analyst at the Washington-based Foundation for Defense of Democracies, which takes a hard line on Tehran and is skeptical of the nuclear deal. “A secure Islamic Republic that does not fear kinetic reprisal is more likely to engage in low-level proxy wars and foreign adventurism, much like we see today,” he said. Meanwhile on Tuesday, Iran broke ground at its Bushehr nuclear power plant for two more atomic reactors to generate electricity. State television quoted Ali Akbar Salehi, the head of the Atomic Energy Organization of Iran, as saying the first new reactor would go online in seven years, while a third would be active in nine years. Russia will provide assistance in building the new reactors as Moscow helped bring Bushehr online in 2011. It marks the first expansion of Iran’s nuclear power industry since the atomic accord.